The days are flying by right now. From our Hallowe’en Centres Party and the Hallowe’en Assembly, we went straight to Remembrance Day activities and the Remembrance Day Assembly. Although we’re going to be starting our theme on “Bears” for the next few weeks, we’ve already started planning ahead to Christmas which is going to be here in no time at all. In between times we’re continuing with our Alphabet letter of the week (sound/symbol relationship and correct letter formation), writing pages for our class big books, and working on phonological awareness skills (phonemic awareness, syllable awareness, rhyme awareness, word awareness and sentence awareness). We’ve seen our Buddies for seasonal craft-making and to start putting our Kindergarten scrapbooks together for our children’s special momentos of some of the best work they will have completed this year. And in math, we are having a lot of fun with sorting and classifying, counting sets to 10 and we’re always working on the new pattern for each month (November is ABC) and being attentive to where we might see that pattern in everyday life. Wow, we’ve been busy. We think it’s time for a self-regulatory moment and a Crocodile breath. Here is a gorgeous book we want to share with you about breathing. Thank you to our Kindergarten teaching partner, Charity Cantlie, for bringing it to our attention! 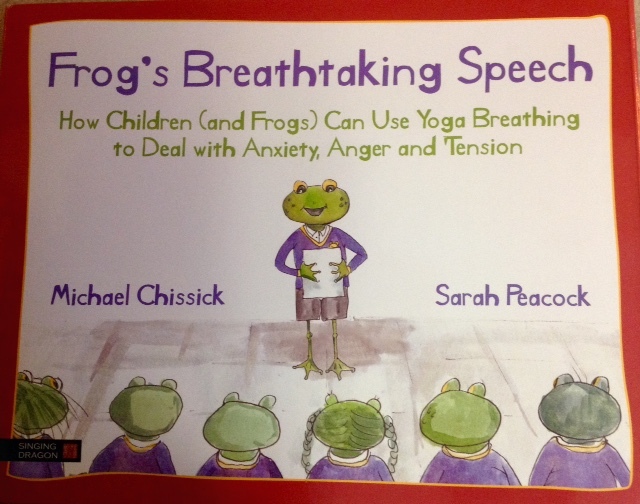 Frog’s Breathing Speech: How Children (and Frogs) Can Use Yoga Breathing to Deal with Anxiety, Anger and Tension by Michael Chissick and Sarah Peacock, is a beautifully written book that tells the story of Frog, who must give a speech about breathing to his class. He knows nothing about breathing, and so asks his friends for help. Crocodile, Lion, Humming Bee and Mr.Gumble the Woodchopper all explain how they use their breath for specific situations (calming, tension, headache, anger), what they do and why their breathing strategy works for them. Frog becomes less scared as his friends teach him about breathing and of course, after reflecting and choosing the appropriate technique for his situation, he gives an excellent speech at school the next day. We don’t want to give away the whole book, but as a brief example, Crocodile shows Frog how he breathes: “I breathe IN through my nose, Then I breathe OUT through my nose.” We love how he explains that this technique of breathing is for calming, and that if we are feeling “worried, anxious or even frightened about something, this way of breathing will help you deal with it better.” The colourful illustrations show how the animals’ posture for breathing. The author has also included a lot more valuable information about how to use the book in your teaching, including the postures and breathing techniques for the children. Breathing is a very important self-regulation strategy we use daily in our classrooms. We have a designated time, immediately after recess, where we intentionally practise our breathing. 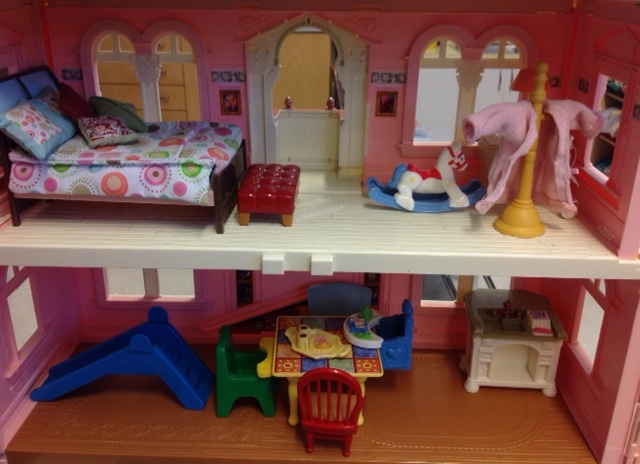 Our routine has the children enter the classroom quietly and we meditate to quiet music. Many children instinctively know to sit cross legged, spine straight, eyes closed and their palms on their knees. Following the music we begin the core practise and we lead the children through a deep breathing sequence, being mindful of our breath, gently pushing sounds away, to listen to ourselves breathe. In the afternoon, before we have a read aloud story, we deliberately practise our breathing again, using the breathing ball (which we think is best suited for the Crocodile and Humming Bee breathing techniques). We are going to start teaching the breathing techniques of Frog’s friends in the upcoming weeks. We’re ready to deepen our learning and understanding of breathing so the children can continue adding to their toolkit of self-regulation strategies that work for them. We would like to thank our Principal, Valerie Brady, for kindly purchasing this book (and others to be shared in a future post) for each of our classrooms. For more on this book and others, visit http://www.yogaatschool.org.uk.